West Virginia University has been selected as the recipient of the Heiskell Award for innovation in international partnerships with its strategic partner in the Middle East, the Royal University for Women in Bahrain. Awarded by the Institute of International Education, the distinguished award is given to institutions that demonstrate excellence in international education. As a recipient, WVU will be showcased as a best practice at the 2018 IIE Best Practices conference and will be represented on a panel-discussion with other leaders in international education. West Virginia University’s partnership with the Royal University for Women started in 2009, shortly after RUW was founded by four WVU alumni with the goal of increasing women’s access to high-quality education in the Middle East. The founders, four brothers who graduated in the 1970s and 80s, looked toward their alma mater for a partnership focused on creating opportunity, developing cultural understanding, and advancing access to quality education. “This award is the result of the work of many Colleges, departments, and individuals at WVU and is a testimony to the power of a University having a pervasive, international mission, strongly supported by the President and Provost,” said David Stewart, associate vice president for Global Strategies and International Affairs. The partnership has successfully supported a bilateral education abroad program, sending over 50 WVU students to Bahrain since its inception, with dozens from RUW coming to WVU; an annual student debate on women’s issues; a robust series of workshops focusing on such topics as forensic accounting, cybersecurity, family business, and recently occupational medicine; the collaboration of an annual conference on women’s issues; courses taught in leadership studies; WVU faculty serving as Fulbright scholars at RUW; and visiting lecturers and scholars in residence from a variety of disciplines. The WVU-RUW Global Portal, part of WVU’s Office of Global Affairs, opened on the campus of RUW in October 2017. “The WVU-RUW Global Portal is our connection to the region. 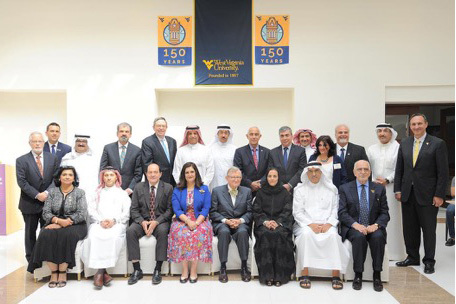 It connects WVU with industry, government, and educational partners in the Middle East, while helping to recruit talented students from the region to come to WVU,” added Brustein. 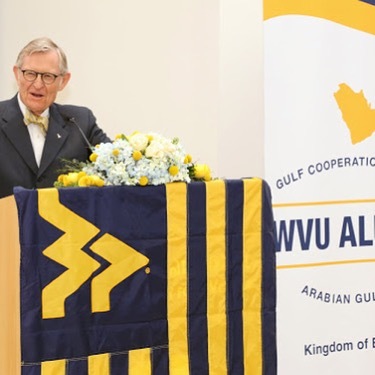 The WVU-RUW Global Portal also works closely with alumni in the region, with over 120 alumni attending the Portal’s opening and chartering of the Gulf Cooperation Council Alumni Chapter last October. Possibly the most momentous achievement of the partnership, in September 2017 WVU enrolled its inaugural class for its civil engineering program taught in Bahrain, the University’s first degree program offered overseas. With the strong partnership between WVU and RUW, the co-ed program is hosted at the RUW, in separate section of the campus. The Heiskell Award for International Partnerships will be awarded to West Virginia University on March 16, at the IIE Best Practices Conference. The Heiskell Award is named after the late Andrew Heiskell, former chairman of Time Inc. and a member of the Executive Committee of IIE’s Board of Trustees.